Bowling Green’s 2018-2019 campaign ended at 7:12 PM on Saturday night. Questions about what would happen next started coming at 7:15 PM. Bowling Green has been the model of stability over the last nine seasons. 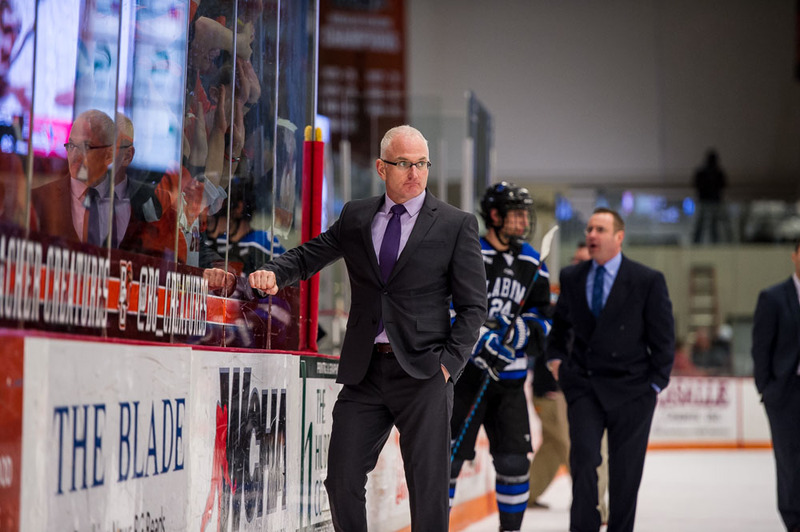 Head Coach Chris Bergeron and assistant coaches Ty Eigner and Barry Schutte have remained an in-tact collective for every season of the Bergeron era. The program has won at least one postseason series every season in that time as well — a feat no other program can boast. Bergeron has been the target of rumors for over a week now, as Miami decided to part ways with longtime bench boss Enrico Blasi. Bergeron, a Miami graduate and longtime assistant coach under Blasi, is the presumptive favorite to move back to Oxford. It’s a story that longtime fans of BGSU hockey have seen play out before. Ron Mason (Michigan State) and Jerry York (Boston College) left Bowling Green to answer the call back “home.” It’s not difficult to imagine that Bergeron will have some missed calls from the 513 area code today. Bergeron has accrued an overall record of 171–154–44 during his time at Bowling Green. Those unaware of the state of the program a decade ago might not be impressed by a .526 winning percentage. But, considering the state of the program when Bergeron was introduced the turnaround has been a 180 shift. The ice arena, a longtime eyesore and embarrassment for Bowling Green due to neglect, finally started to receive upgrades and renovations that brought the building back to a respectable level for a division one facility. The yearly HOGO golf outing for player alumni grew to record numbers as former icers found their way back to Bowling Green. Most importantly of all, 20-win seasons and national rankings became an expectation rather than a pipe dream. “Berge” has completed all of this while falling right in the middle of the WCHA salary bell curve. Bergeron makes less than Mike Hastings (MSU), Grant Potulny (NMU), Joe Shawhan (MTU), and Tom Serratore (BSU). For all of the financial support that the program has received, Bergeron’s salary of $185,000 for the fiscal year 2018 is below the market price for a quality division one hockey coach. Not all fault falls to the athletic department, as they deal with a shoestring budget on a year-to-year basis while supporting an FBS football team. But, it’s completely fair to say that Bergeron is one of the most economical coaches in the nation in terms of cost per win ($7,400). What type of benefits would Bergeron find in taking his talents to Oxford? For one, he’d be playing in a top-tier facility with every amenity imaginable. The Goggin is easily the best college hockey facility in Ohio and has been maintained and updated to remain there for years to come. Bergeron would also be able to recruit players to a league that emphasizes skill and frowns upon the interference/obstruction games that plague the WCHA on a weekly basis. Finally, Bergeron would return home: a place he raised his children and began his coaching career. He helped build Miami into a national power and it has to be attractive to return the RedHawks, who have three-straight losing seasons, to push Miami back to a national power. But, sometimes the grass isn’t always greener. Bergeron is probably the most loved coach at Bowling Green. He’s a model coach to speak to alumni and boosters due to his positivity and candor. While there are always grumblings from those expecting more from the program, Bergeron is nearly universally loved by the Falcons’ fan base. If he has a losing season or two at Miami he might not face the same friendly faces at the grocery store he’d see in BG. The NCHC is also a buzzsaw league. There are no Alaska-Anchorage’s in Miami’s conference and most trips are out of the eastern time zone. No matter what happens over the next week, it’s time for the BGSU athletic department to take a hard look at the hockey program and it’s financial considerations. There’s one program at BGSU that can compete for a national championship on a yearly basis and it’s hockey. But, it can only compete at that level if it receives the financial support required. The department paid for a feasibility study to fund raise and build an addition onto the ice arena that would have added another sheet of ice and renovated the main arena sheet. It’s been radio silence ever since including failing to be included in BGSU’s newest “For the World” campus-wide fundraising campaign. Renovations to the Doyt Perry football stadium were included, despite producing far fewer revenue opportunities on a day-to-day basis. If this is truly the final days of the Chris Bergeron era for Bowling Green hockey I can only hope he receives a proper thank you from the program supporters. Bowling Green was the worst job in the country when Chris was introduced in 2009, and Bergeron has turned the program into a nationally relevant one again. If it turns out that Bergeron wants to remain in Bowling Green the program should be given the assets necessary to move the Falcons’ program to the top-tier in college hockey.